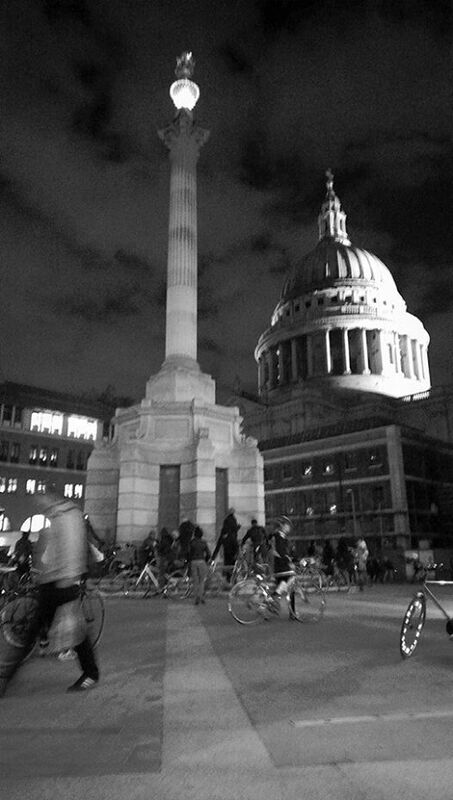 We loved the London Critical Mass ride. This time, it went to the site of the latest killing. It was foggy. It had been foggy all day. Or misty maybe. Especially next to the Thames. And we all seemed a bit foggy too. The ride didn’t start until 19:22. Even then, there wasn’t much attitude to get moving. The December ride can be bitterly cold which motivates us to move. Not this time. The ride went across from Waterloo Bridge to Kingsway on top, via Aldwych,not through the tunnel this time. Also, at Holborn, it went north past both main crossroads, and turned left into Bloomsbury Place, and on to Great Russell Street (just like last month … why this sudden fetish for goingpast the British Museum?). Reportedly 26km – or 25.27Km 3hrs 14min from start to Buckingham palace. Nice route, nicely paced with good bunching so that the mass stayed together pretty well – really enjoyed it, we stayed in until about 10.30pm. 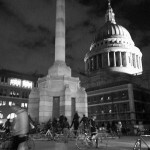 The route included St Paul and Brixton – and a shopping mall in between. It was a great night, lots more than last month and without the cold rain we had last year.